When you replace fluorescent, HID, incandescent, or halogen bulbs with LED lights, there’s more savings potential than you might have realized. Most of the savings come into play when people underestimate just how inefficient those classic bulbs are. They lose a significant amount of light before it makes it to where it’s needed, and they lose it much faster than LEDs. This problem is known as lumen or light loss. All lighting types experience it, and it’s lost in a variety of ways, but LEDs experience the least amount of it. 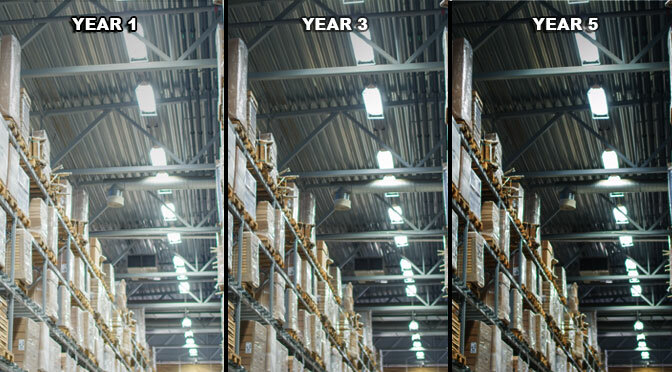 Factoring in lumen loss helps you shop for the most cost-saving LED replacements. There are several reasons to make the switch to LEDs. One of the most important is efficacy. Comparable LED lights use significantly less energy to emit the same amount of light that you’re used to. Compared to other lighting types, LEDs have better efficacy over time. This is, in large part, due to their slow rate of lumen depreciation. If you’re replacing a traditional fixture with an LED equivalent, you’ll probably try to find something that emits the same amount of light. It’s a given that you’ll save energy because the LED light will consume less power, but you can save even more. How? You don’t need the same output to get the light you’re used to. You’re getting much less light than what’s claimed. It can be far off from initial claims and even more so after some time has passed. This means that you can choose an LED replacement that emits less than what your old fixture claimed and still experience the same or brighter output. This brings wattage requirements down and saves even more energy. Before we get into figuring out which output to choose, let’s discuss how light is lost. Fixtures sacrifice lumen output when they utilize reflectors to deliver light to an intended area. No reflector will yield the exact amount of light emitted from the bulb. Lost output is determined by the reflector material and how many times light bounces off of it. The reflectivity of the material can vary from around 80-95 percent. This means that aluminum with a reflectivity of 90 percent will reduce a bulb’s output by 10 percent each time it bounces. Light can bounce several times before it makes its way out of the fixture. 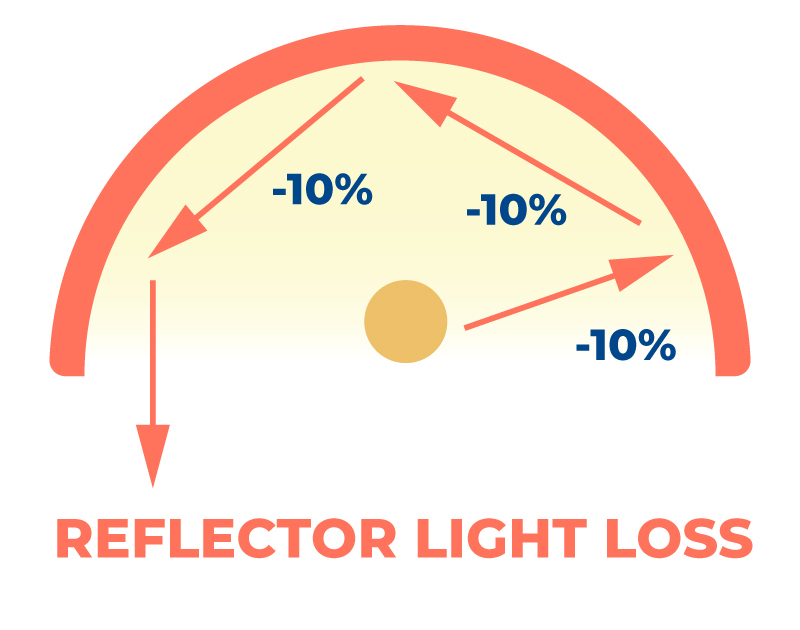 The reflector in the example below uses aluminum with a reflectivity of 90 percent. In this instance, light bounces 3 times, so by the time it makes its way out, 30 percent of the light’s output has been lost. Regardless of fixture type, if light has to pass through anything, output will take a hit. Most fixtures have some sort of covering either for light focusing, protection, or to change the light’s color. The extent to which output is reduced depends on the material and its design or intended purpose. Lenses, covers, and dirt will have an impact on LED fixture output, but because lumens are measured for complete LED fixtures, those factors (dirt excluded) won’t impact output further. The exception is if you add a lens accessory or use an LED bulb in another fixture. That fixture’s lens or filter will reduce light intensity. Fluorescent, incandescent, halogen, and HID lights emit a substantial portion of their output in the invisible infrared (IR) or ultraviolet (UV) spectrums. This means that claimed output isn’t what you can actually see. An incandescent bulb generally wastes 90 percent of its energy as IR heat, and just 10 percent goes toward making visible light. Unless an LED bulb or fixture is specifically IR or UV, it produces little to no UV light or infrared radiation. Beam angle plays a big role in how much light makes it to where it’s needed. Incandescent, halogen, fluorescent, and HID bulbs have 360-degree beams. They emit light in all directions—even where it’s not needed. Reflectors are necessary to redirect light, but light is lost in them. LEDs are directional, so in an LED high-bay fixture, for example, all LEDs would aim where they’re needed and a reflector wouldn’t be necessary. There are 360-degree LED products, such as corn bulbs and standard globe bulbs. These products are necessary for certain applications, like retrofitting HID high-bay fixtures and post top lights, but whenever a reflector is used, some light will be sacrificed if it has to bounce off of it. You can maximize savings when switching to LED lights if you choose the right beam angle for the intended fixture mounting height. If you’re mounting a fixture on a high ceiling, choosing a tight beam angle will result in more light on the floor or brighter light over a certain area on the floor. A 360-degree bulb will cover a larger area but be less intense than a fixture with comparable output and a tighter beam. With a tighter beam angle, you can use an LED fixture that emits less light than your old bulb claimed, which saves more on energy costs. Supply voltage/current fluctuations as well as failing or inefficient ballasts can result in lower lumen output. Light loss of up to 25 percent is possible in ballasted fixtures. LED fixtures use drivers, which are much more efficient than ballasts. LED drivers can reduce output by up to just 15 percent over time. 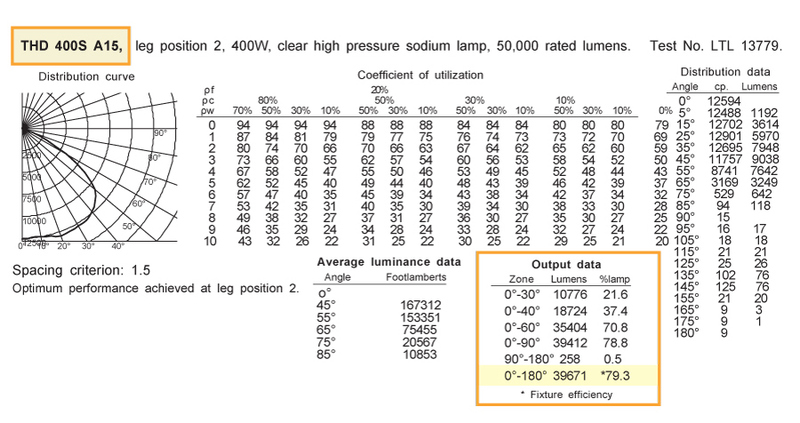 Fixture or environment temperature can greatly reduce lumen output. LEDs create the least amount of heat compared to any other light type. Incandescent bulbs waste 90 percent of their energy as heat, and just 10 percent goes toward creating light. LEDs use 80 percent of consumed energy to create light. Other lighting types run much hotter, which results in a fast decline in output over a short period of time. LED lumen output declines slowly over a long period of time. 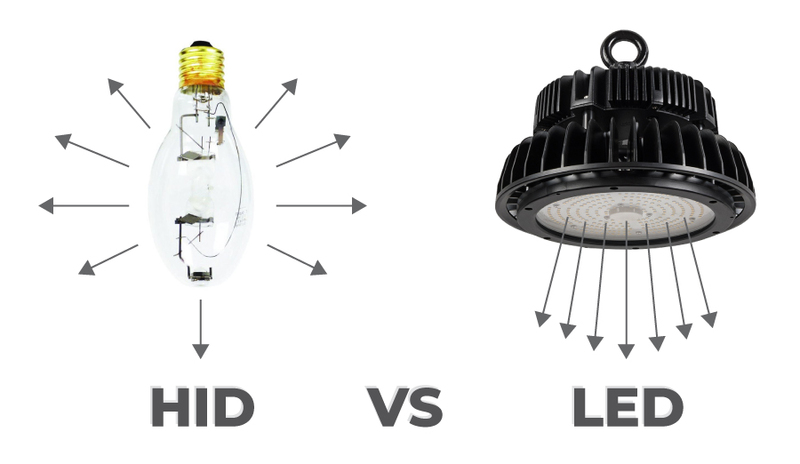 How much light are you actually getting, and how do you know which LED light to choose? The best way to know what lumen output to choose is to compare LED fixture lumens to the zonal lumens of another type of fixture. Zonal lumens are lamp (bulb) lumens minus fixture efficiency. Lamp lumens don’t account for light loss from reflectors, ballasts, filters, etc., so to use them would be inaccurate. Zonal lumens factor in those things and give more realistic expectations of a fixture’s lumen output. Remember unless you’re buying an LED bulb and using it in an existing fixture, LEDs are integrated into their fixtures, and lumens are measured for that fixture as a whole. There are no unexpected losses from factory-installed lenses, filters, etc. Zonal lumens can be found on spec sheets or LM-79 reports. 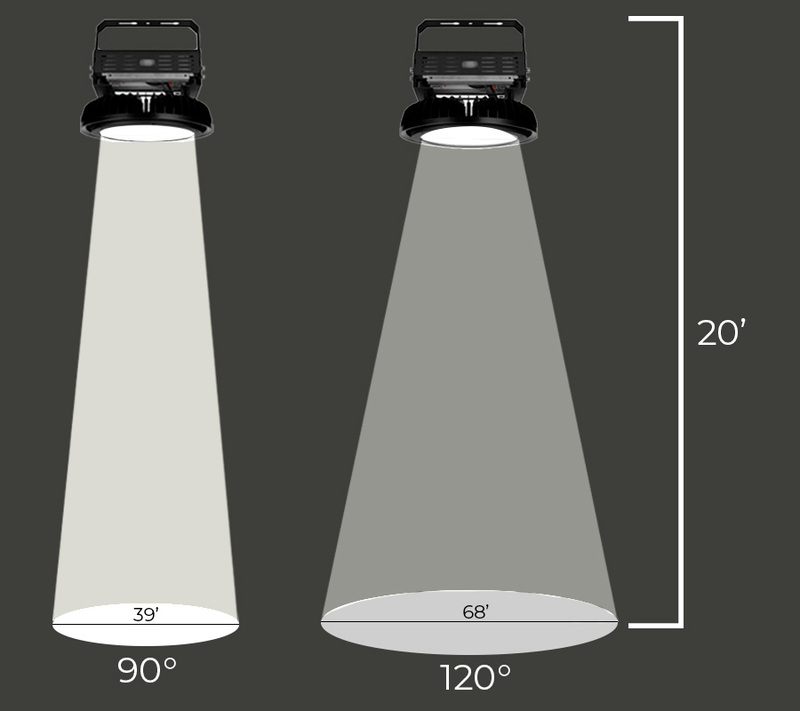 Look for lumens that are reported from zone 0-180. Using zonal lumens shows you that you can choose a less powerful LED fixture than you thought was needed—maximizing savings even further. For example, retailers for the THD 400S A15 HID high-bay light from Lithonia Lighting report 50,000 lumens at 400 watts. Looking at its zonal lumens shows you what you’re truly getting. 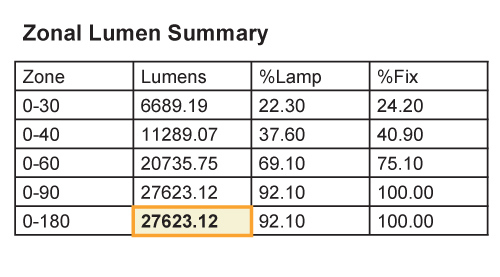 When fixture efficiency is taken into account, lumens drop to 39,671. And because HID fixtures experience a faster decline in efficiency than LED lights, output won’t be 39,671 for very long. In fact, if you figure in an average HID 20,000-hour L70 life span and use that light for 10 hours a day for 365 days per year, it will be emitting 27,300 lumens at the five-year mark. L70 is the point at which a light emits 70 percent of its initial output. This is usually when a difference in light output is apparent and bulbs tend to be replaced. You could choose this 300-watt LED high-bay light to get the initial output (zonal lumens) of the Lithonia light; the LED light emits 39,000 lumens. If you’re replacing an HID fixture that has comparable specs to the Lithonia fixture and are ok with your current light output, you could choose this 200-watt LED light with a lumen output of 29,000. Of course, you’d have to have a situation close to the example mentioned earlier as far as watts, usage, etc. The point is that if you’re replacing an old fixture and want to match current light output, you can save even more by choosing a less powerful LED light than you’d need to match your current light’s zonal lumens. Using a light meter is the best way to know what your current output is. Here’s another example. The HFA3E654 T5 fluorescent high-bay fixture from Howard Lighting reports 30,000 lumens at 360 watts. Zonal lumens show an output of 27,623. To match that output, you could choose this 200-watt linear LED fixture; it has an output of 27,600 lumens. You could also choose this 165-watt LED fixture to save more; it emits 21,500 lumens. Remember it won’t take long for the fluorescent fixture to become less efficient and lose a lot of light. Fluorescent fixtures have an average L70 life span of 10,000 hours—even worse than HID lights. Understanding how light is lost and the reality of how much you’re truly getting with an HID, fluorescent, incandescent, or halogen light source enables you to make the best decision when choosing LED lights. They might be slightly more expensive to purchase than alternative light sources, but they are more efficient, have a much slower rate of lumen depreciation, consume significantly less power, and could qualify for energy rebates. Next time you need a light fixture, think about the output you were getting, the output you want, and compare your old light source or a similar light to LED fixtures. Dig into spec sheets, and think about all the ways light can be lost. You’ll see that LED lights are the way to go.